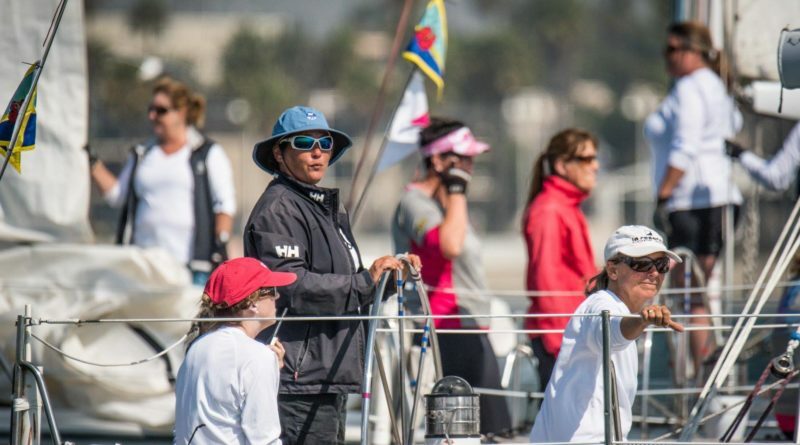 CORONA DEL MAR (LOG NEWS SERVICE) —Bahia Corinthian Yacht Club will host the Sailing Convention for Women in Corona del Mar on Saturday, Feb. 2, 2019. Presented by Gail Hine and sponsored by BoatUS, the daylong event is a series of 33 workshops for ladies-only and includes shore- and-boat-based sessions that offer beginners to experts a welcoming environment to learn more about all things sailing. Attendees select a combination of workshops in areas that best fit their interests and abilities. Course instructors are top women sailors, many of whom are U.S. Coast Guard-licensed captains. Workshops include Welcome Aboard for Beginners, Diesels, Going Up the Mast, Docking, Suddenly Singlehanded, Weather, Sail Trim, Basic Navigation, Electronic Navigation, Electrical Systems, DIY Canvas Projects, How to Heave a Line, Nighttime Navigation, Winch Workshop, Spinnaker Rigging, Offshore Cruising, Emergency Equipment & Life Raft Demo, and Introduction to Sailing. To top off the event, the featured speaker at dinner is Melody Kanschat, a sailor with 40 years of sailing experience beginning in the Midwest on small boats and now in California aboard her C&C 40, Harmony. Throughout those four decades, Kanschat has applied the lessons she learned as a female skipper to her professional career in public radio, in art museums as president of the Los Angeles County Museum of Art and as executive director of the Getty Leadership Institute. Kanschat will talk about the styles and characteristics of women leaders and those pivotal moments when both skippers and crew embrace their leadership. She also will share tips for women sailors in exerting their own leadership to be happy and productive members of any sailing crew. Prepaid registration is required as space is limited to approximately 250 attendees. The early bird registration fee from Dec.10 through 31 is $200. Registration Jan. 1 through 29 is $225. Late registration is $250. The fee includes workshops, breakfast, lunch, dinner, souvenirs and handouts. To obtain a reservation form, email gail@sailingconventionforwomen or call 951-677-8121. Bookings can be made online at SailingConventionforWomen.com beginning Dec. 10.